"I can't get it out of my head, but I can't manage to pin it down either." One of the most notorious genres to come out of Italy is the giallo, lurid mysteries that take their name from the bright yellow covers of cheap paperback mystery novels. 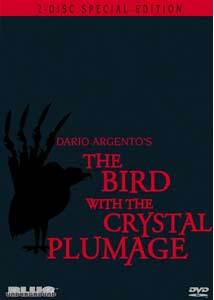 Although there had been earlier prototypes such as Mario Bava's Blood and Black Lace (1964), the full-blown genre arrived on the scene with the first film of Dario Argento, The Bird with the Crystal Plumage. Everything essential to the genre is here: psychosexual madness, lurid murders and most importantly, the persona of the mysterious black-gloved serial killer. American writer Sam Delmas (Tony Musante) is walking down a Rome street when he spots a brutal assault on a woman, Monica Ranieri (Eva Renzi), in an art gallery. His efforts to help are thwarted as he is caught helplessly between the glass doors at the entrance to the building. Plagued by the feeling that he saw something important, but unable to put his finger on exactly what that might be, he is held in Rome by police inspector Morosini (Enrico Maria Salerno) for further questioning and under possible suspicion. But soon Sam and his girlfriend Julia (Suzy Kendall) are being threatened by mysterious phone calls and attempts at homicide to shut him up before he remembers the critical clue. The trick of the barely-remembered clue will figure again in Argento's Deep Red a few years later, although the director plays a bit more fair in that film. The clue is actually briefly glimpsed in that picture (though its importance is completely unrecognized by the viewer) but the critical moment is never actually seen in this film until the denouement. It's kind of a silly contrivance, but Argento's films have never been long on logic, more likely to lean on pseudoscience. That comes through in his proto-CSI police procedural actions that don't hold water (though none are as ridiculous as we see later in Four Flies on Grey Velvet). Memory is much more likely in fact to fill in the holes with what one expects to see than to come up with an independent fact that doesn't fit a preconceived notion. Never mind that Argento never quite explains why Reggie Nalder (The Man Who Knew Too Much) is trying to kill Sam; it doesn't make much sense in light of the unmasking of the real killer in the finale. Nonetheless, if you're willing to accept Argento on his own slightly off-kilter terms, the film still has quite an impact. It was certainly shocking in its original release for its ample gore (even if it's a bit tame today), and for this release, taken from the original negative, several previously-unseen moments of additional blood-letting are reinstated. It was also somewhat ground-breaking for the use of the first of a string of openly gay characters who are present not because their homosexuality is important to the story, but simply because such folks are present throughout the world. Argento's wittiness comes through in a ridiculous police lineup that only consists of a parade of different perversions, to Sam's disgust. Musante doesn't make a very appealing lead, but the writing doesn't help him any; even when Julia has been directly threatened by the black-gloved killer, he repeatedly leaves her alone and gives the killer plenty of opportunity to terrorize her. Although Kendall isn't called upon to do much beyond be sexual and threatened, she does both with sincerity and impact. Salerno is fairly entertaining in his world-weary cynicism and his apparent willingness to let the American do the investigating for him. Mario Adorf has a nifty but appalling little role as an artist who specializes in cat cuisine, breeding them for the purpose. Sorry, Intrigo. There's also a prominent part given to a stammering pimp in prison who may or may not have a salient clue but is entertaining nonetheless. Not only was this Argento's first picture, but it was also the first color film shot by Oscar-winning cinematographer Vittorio Storaro. The film has plenty of visual flair, which may be attributable to either or both of these creators, such as a dazzling shot up through a staircase of concentric triangles. There's also sharp use of the killer's POV in numerous sequences, as well as the POV of victims. The latter is the most interesting in a shot of a plunge from the sixth story (which as Argento reveals in the documentary, was accomplished by throwing the camera out of a sixth floor window--nothing like the direct approach!) There's brilliant use of color, with most of the picture filled with darkness and shadow but occasional flashes of vivid reds and yellows. Argento is best appreciated for his set pieces: the opening torment trapped between the glass doors, a deadly chase through a bus yard, Suzy Kendall under siege in the apartment—all are memorable moments that stick with the viewer long afterwards. As a whole, it still holds up as well as any of Argento's more mature works. Image Transfer Review: The DVD sports a new transfer from the original negative, and it has very little in the way of flaws, other than the excessive edge enhancement that Blue Underground seems to insist on applying to most films. That's fairly destructive in a film that uses high contrast as much as this one does, but otherwise the picture looks splendid. Color is vivid, with eye-popping reds and excellent textures. If edge enhancement doesn't bother you this will be very satisfying. Audio Transfer Review: Italian films of this period were almost never shot with live sound; the multinational cast would speak their own tongues and the lines would all be dubbed in later, so it cannot be said that there is a definitive audio track. One is probably best served with English, since that's what Musante and Kendall are speaking. Whether you prefer English or Italian, there's a baffling array of audio choices, beginning with the original mono, largely superfluous Dolby Surround mixes, 5.1 EX mixes and a 6.1 DTS in English only, for a whopping seven tracks. Since they're not switchable on the fly, they weren't all examined in detail. The DTS track sounds fine, with a nice broad soundstage and some interesting effects. There's not much bass on any track, though. Ennio Morricone's atonal jazz score comes across quite well; the muted trumpet doesn't require a great deal of bass to have its impact. Extras Review: Blue Underground provides a healthy sampling of extras on this release, starting with an informative and chatty conversation between Alan Jones, author of Profondo Argento and horror writer Kim Newman, which never has a dull moment. The two participants have plenty of back and forth and make seemingly off-the-cuff observations that add much to a second viewing. There are also Italian and international trailers and a pair of US television spots for the film. A second disc is a little thin on running time, but contains plenty of substance. Out of the Shadows (18m) is an interview with Argento that focuses almost exclusively on this film, and he addresses amongst other issues his reputation for misogyny and his working relationship with Storaro. Three featurettes cover others involved in the filming. Ennio Morricone talks about his use of serial structures in the composition of the score in a 7m:32s presentation. Storaro holds forth on the use of imagery to convey psychology and his team approach to cinematography in a 10m:02s piece. Finally, an 11m:20s chat with Eva Renzi reveals that she was still quite bitter at the way her career was derailed by this film. The talk was apparently shot just before her death earlier in 2005, and it's too bad she never was able to come to terms with the picture. The seminal giallo film, in a beautiful transfer from the negative, with an over-the-top array of sound choices and some excellent supporting material make this a must-buy for thriller fans.